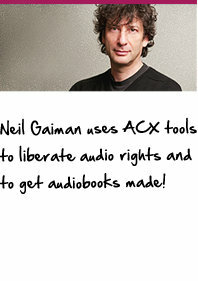 Neil Gaiman uses ACX tools to liberate audio rights and to produce quality audiobooks! Neil Gaiman is famous for his internationally bestselling and critically acclaimed science fiction and fantasy novels, as well as his short stories, comics, graphic novels, radio-plays, and screenplays. His books have won Bram Stoker Awards, Hugo Awards, and Nebula Awards; he’s also the first author to win both the Newbery Medal and the Carnegie Medal for a single work of fiction: The Graveyard Book. The global popularity of Coraline, the Sandman series, American Gods, Anansi Boys, and Neverwhere has made Gaiman’s voice—on the page, on Facebook, and on Twitter—immediately recognizable and, at the same time, inimitable. At Audible, Gaiman’s voice as a performer graces nineteen audiobooks, both work of his own and the work of other authors. Now, using ACX, Gaiman has started his own audiobook label, “Neil Gaiman Presents”, to find and produce great new audiobooks. "When Don Katz first called and explained ACX to me I started to get excited. I've loved narrating audiobooks—winning the Audiobook of the Year Audie Award for The Graveyard Book was one of my proudest moments—and I am lucky in that almost all my books are now available in audiobook form. But I'm constantly astonished at how many great books, beloved books and books that have a special place in my heart, are not, and mostly never have been, available as audiobooks. ACX seems a brilliant way to change that. In an ideal world you should be able to listen to every book you love being read by someone who's perfect for it. Getting involved in ACX, and curating my own label within it, is my way of trying to help us get to that ideal world." Gaiman is a voracious reader, and the titles he chooses for “Neil Gaiman Presents” reflect the diversity of his taste. Gaiman has been scouring the rights posted on the ACX website to identify candidates for “Neil Gaiman Presents” and will also use the ACX marketplace to pull in additional titles he wants to produce. Gaiman will use the ACX site to solicit and review auditions for the books in his label and will use the tips found on ACX in the "Promote Yourself" section of ACX, as well as his own world-renowned social media savvy, to spread the word about the finished audiobooks. Finally, he is encouraging author and actor friends to participate in ACX by posting rights or auditioning for audiobook gigs even outside the scope of ”Neil Gaiman Presents”. If you’re an author or Rights Holder, post your rights on ACX and make your work visible to the best narrators and studio pros in the business. Gaiman—and numerous other Producers—are looking for books that could be great audiobooks. If you’re a studio pro looking for your next production, check out the rights postings on ACX, for a single book or enough titles for a whole new audiobook imprint! I’m inspired by Neil Gaiman – get me started on ACX now!